What? Me a TMJ Patient? Why do people have canines if they aren’t dogs? Can Childhood Trauma Alter Occlusion? Buy one veneer, get a second one free! Really? Should You Be Treating Sleep Apnea? Do TMJ Problems Go Away By Themselves? Your patient has degenerative arthritis of the TMJ: What now? Night guards: A bad idea, or an idea badly done? TMJ Pain: Whose Fault Is It? Would You Like Scaling and Root Planing With That? Angela, a bright, pretty, 30 year old came to me for a TMJ exam last week and when I asked her who her general dentist was, she told me she didn’t have one. I did six-point perio probing. This young lady had no visible calculus and I found one place—mesial of #3—that had a probe score of 4 mm. All the other scores were 2 or 3 mm. Healthy, normal gum tissue and no bleeding points whatsoever. Four quadrants of root planning? Totally unnecessary. Angela isn’t alone of course, or there’d be no need for me to write about her experience. 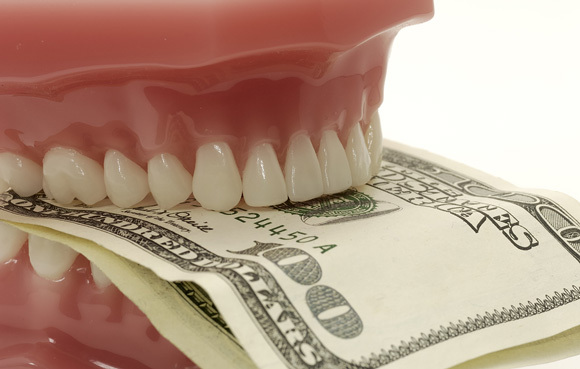 The over-selling of periodontal treatment is all too common. But scaling root planning is over-recommended as a routine in many places. So what is a patient to do? And over and above that, what is causing this trend? To the patient: If you have gums that bleed when you brush or floss, if your gums are red and sensitive, tender, puffy or swollen and you are told you should have periodontal treatment starting with a few visits of scaling and root planning, then it is very likely the correct call. You have every right to get a second opinion, but with those signs and symptoms, by all means you should treat the problem. But let us suppose that you have had a long association with a dentist you trust, and you have never had tender, bleeding gums, and then you change insurance (or it gets changed for you—thanks Boss). Now you’re told you have to change dentists—to one of the few names on a short list. When you go to the new place for your bi-annual cleaning, you’re told you have gum infection that needs treatment. Now you may well have some healthy skepticism. Go out and get a trustworthy second opinion. Oh, I see. You’re saying that you have new insurance and you have to go this particular clinic to have your exams covered. What to do? Ask your friends and neighbors for the name of a dentist they like and trust and pay for that second opinion out of pocket. I know that paying for stuff out of pocket when it’s supposed to be covered by your insurance may be against your religion. Do it anyway. If that unexpected diagnosis of gum disease is wrong, don’t treat it. I’d actually say that if you find out the new clinic gave you improper advice, you should stick with your old trusted dentist. Yes, stay with him or her even if the new insurance doesn’t cover your visits there. What’s trust worth? It’s not just gum disease that is often over-diagnosed, but teeth with cavities that need fillings or crowns as well. Nine seems to be the usual number, as in Mrs. Jones you have nine cavities. Or Mr. Smith, you need nine crowns and also one root canal. I represent El Cheapo Insurance and wanted you to know that we have 10,000 members in your area who are covered by our dental plan. If you would just review our approved fees on page two of this letter and then sign on the dotted line, I can assure you that we can fill your schedule with thousands of new patients. Yes, you will be doing dentistry at a small discount, but I’m sure you’ll make up for it in volume. And what happens? The dentist (or a group of dentists in a large clinic setting) signs the contract and indeed his schedule fills with a ton of new patients. But sadly he finds out that with light, heat, staff salaries, equipment payments, lab fees, and rent costing close to 70% of his usual fees, a 30% discount is a break-even point. Therefore, no money left over for the dentist to have any take home pay. UNLESS…unless he can find some work that isn’t covered by El Cheapo Insurance (bleaching, cosmetic crowns and so on), or he learns how to do dentistry really fast so he can make that hourly overhead even on El Cheapo’s reimbursement rates. Four quadrants of root planning done in one visit (instead of the standard four) works pretty well. Or he up-sells treatment. Or uses his explorer creatively so that an appointment to correct one cavity turns into a visit to fill four. Whenever I hear from one of my colleagues that a patient has left his private practice and gone elsewhere, and that a bunch of new work has been diagnosed, there has ALWAYS been a change to a PPO insurance or similar discount plan. Always. To the dentist: If you are not a member of El Cheapo Insurance and their ilk, just don’t join. I don’t care how many union members they promise to send you. To the patient: If your employer informs you that your old insurance plan will no longer be available and that next year you’re going to be covered by El Cheapo Insurance LTD, ask if you can take the premium he would be paying for you as cash instead. Then just use the money to pay for your care out of pocket. If your employer is not willing to do that for you, decide whether you will even use the insurance. You may choose not to if it requires that you go to a clinic that is not a good fit for you. And if you choose to go to the plan doctor anyway, just make sure you have a reasonably functional crap detector and that it’s turned on. Years ago, when I was a new dental graduate, dentists were ranked second only to clergymen in public trust. Over the last thirty-plus years our trustworthiness ranking has sunk so that we’re closer to used car salesmen in the public view. At least we’re not ranked as low as congressmen. What changed? I happen to place a lot of the blame on the concept of managed care or dental PPO insurance. Of course the culture has devolved drastically and the strong values that once held sway have gradually diminished as well. But I do think that insurance has victimized both the dentists and their patients. Back in 1972, when I was a new graduate, one of my first mentors in dentistry urged me not to join Delta Dental. This was at a time when everybody was a member of Delta. *Is it possible you have complex issues that go beyond the ordinary? Sure. In that case you will need to seek the advice of specialists who may or may not be covered on your plan. William F. Halligan is a 1972 graduate of the University of Southern California’s School of Dentistry. He practiced general dentistry during most of his career with an emphasis on restorative dentistry. He is a member of the American Academy of Craniofacial Pain and a founding member of the Academy of Clinical Sleep Disorders Dentistry. Dr. Halligan’s practice is located in San Diego and is focused on treating TMJ disorders. Thanks for your article. I moved to the city of Philadelphia about a decade ago. Prior to that I had never heard of Root Planing and Scaling. My wife and I needed a new dentist. She was reading the city mag and found one. It was one of those best health providers of the city issue, which I am now very skeptical of. Cut to the chase. He recommended a full four quadrant Root Planing and Scaling, again something I’d never heard of. I bought into it. What was the numerous part was the room I was taken to speak with the finance girl. It was just like at the car dealership where they take you to upsell you on extended warranty. The gal was laying out the costs of the procedure to see if I could afford it or if I wan’t a finance plan. At that point I really should have walked out, unfortunately I didn’t. Well I had the full four quads done in one ‘quick’ sitting, and I was $1200 poorer. 9 years later and I’m visiting a new dentist. Guess what, he is recommending full 4 quads, but at least it’s in only two sittings. I am smarter now and realize that I could probably use it on my lowers but very skeptical I need it on the uppers. I now have a decision to make because I actually like the dentist. Do I go to another dentist, or just challenge him and say no? The fact is, you may actually need this treatment. If root planing is needed, the dentist should be able to show you evidence. Perio probing deeper than 4 mm in multiple areas for example, and places that bleed upon probing. If not convinced, have an exam with a reputable periodontist– a specialist in gum problems. Doctors, it’s here! 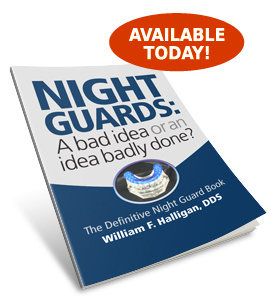 Dr. Halligan’s new eBook will show you how to produce night guards that require far less adjustment and are much more comfortable for your patients. CLICK HERE TO LEARN MORE. I just want to thank you all for the above and beyond care you provided while treating my TMJ issues. I am so grateful I was put in contact with you all. Dr. Halligan, your expertise is truly amazing and has helped my jaw immensely. I appreciate Andrea’s kindness in sitting and talking with me during each visit and Debbie for always greeting me so warmly and being so helpful with providing any information needed for my insurance, etc. You all are a great team! Thank you being so responsive, patient and understanding during a time that was very painful and concerning for me. My situation has improved so much, thanks to your treatment; I will always be appreciative of the help you have provided! I recommended anyone experiencing jaw pain to consult with you on how you can help! We understand the meaning of service and we make you feel comfortable, cared for and understood. 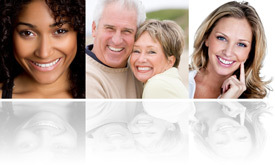 We offer the latest state-of-the-art computerized diagnostics and treatment of TMJ disorders. Dr. Halligan’s San Diego practice is limited to treating temporomandibular dysfunction and orofacial pain. Copyright 2019 William Halligan, DDS. All Rights Reserved. Website Development by Dan Turner.